Addons provide ways to customize translation workflow. 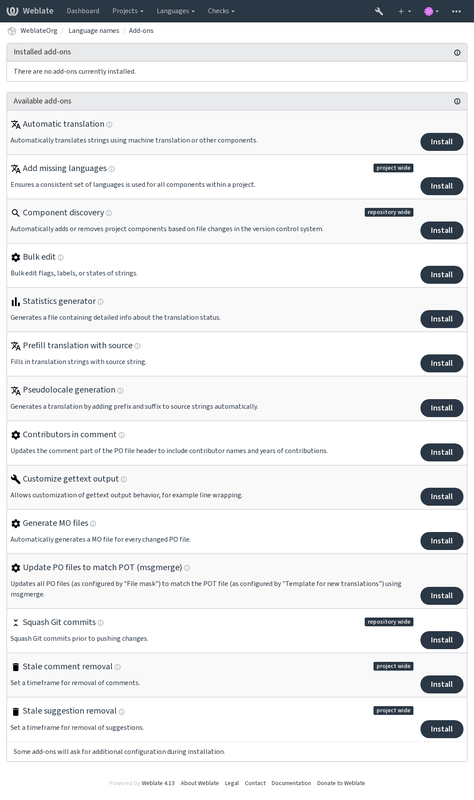 You can install addons to your translation component and they will work behind the scenes. The addon management can be found under Manage menu of a translation component. Update all translation files to match the monolingual base file. For most file formats, this means removing stale translation keys no longer present in the base file. This addon ensures that all components within one project have translation to same languages. Unlike most others, this addon operates on whole project. This addon automatically adds or removes components to the project based on file changes in the version control system. It is similar to the import_project management command, but the major difference is that it is triggered on every VCS update. This way you can easily track multiple translation components within one VCS. To use component discovery, you first need to create one component which will act as master and others will use Weblate internal URLs to it as a VCS configuration. You should choose the one which is less likely to disappear in the future here. Once you have one component from the target VCS, you can configure the discovery addon to find all translation components in the VCS. The matching is done using regular expression so it can be quite powerful, but it can be complex to configure. You can use examples in the addon help for some common use cases. Whenever a new translation string is imported from the VCS and it matches source strings, it is flagged as needing editing in Weblate. This is especially useful for file formats including all strings even if they are not translated. Whenever a new source string is imported from the VCS, it is flagged as needing editing in Weblate. This way you can easily filter and edit source strings written by the developers. Whenever a new translation string is imported from the VCS, it is flagged as needing editing in Weblate. This way you can easily filter and edit translations created by the developers. This addon generates a file containing detailed information about the translation. You can use Django template in both filename and content, see Template markup for detailed markup description. Update comment in the PO file header to include contributor name and years of contributions. Updates the ALL_LINGUAS variable in configure, configure.in or configure.ac files, when a new translation is added. Allows customization of gettext output behavior, for example line wrapping. Updates the LINGUAS file when a new translation is added. Automatically generates MO file for every changed PO file. Update all PO files to match the POT file using msgmerge. This is triggered whenever new changes are pulled from the upstream repository. Squash Git commits prior to pushing changes. Allows to customize JSON output behavior, for example indentation or sorting. This addon sorts the Java properties file. List of addons is configured by WEBLATE_ADDONS, to add another addon simply include class absolute name in this setting. You can write own addons as well, all you need to do is subclass BaseAddon, define addon metadata and implement callback which will do the processing. You can also use addons to execute external scripts. This used to be integrated in Weblate, but now you have to write little code to wrap your script with an addon. For installing instructions see Custom addons. The script is executed with the current directory set to the root of the VCS repository for given component. Absolute path to VCS repository. Repository branch configured in the current component. File mask for current component. File name of template for monolingual translations (can be empty). File name of the file which is used for creating new translations (can be empty). File format used in current component. Language of currently processed translation (not available for component level hooks). Previous HEAD on update (available only available when running post update hook). Post update repository processing can be used to update translation files on the source change. To achieve this, please remember that Weblate only sees files which are committed to the VCS, so you need to commit changes as a part of the script. In many cases you might want to automatically do some changes to the translation before it is committed to the repository. The pre commit script is exactly the place to achieve this. It is passed a single parameter consisting of filename of current translation.